Even rain and 50 degree temps can’t keep a group of BBQ and Wing enthusiasts from turning out. 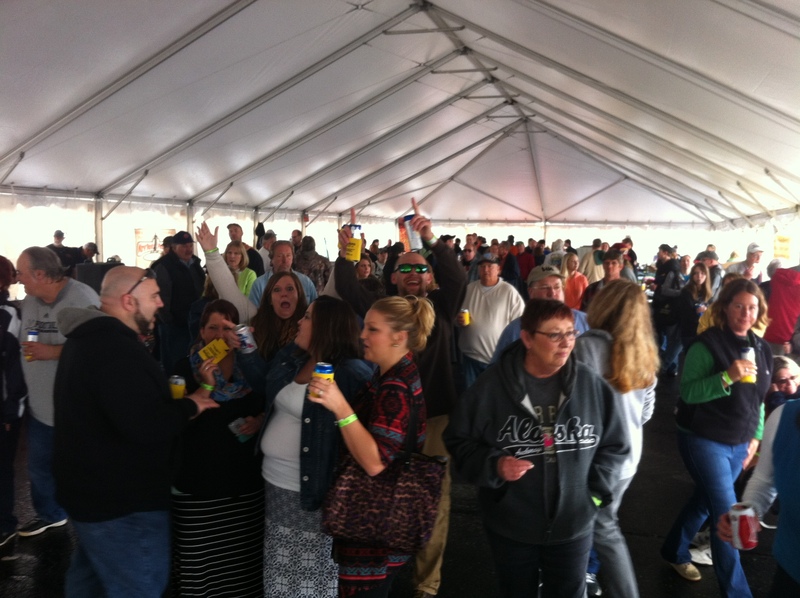 The Joe Lamb Jr. BBQ & Wings Showdown reached record attendance numbers in spite of it. A total of 430 folks showed up today to enjoy the fantastic food offered by nine Outer Banks Restaurant Association members. In total, the crowd got to sample 16 different items, and believe us when we say no one went home hungry. We knew the weather wasn’t going to be so great today, so thankfully the awesome team at Ocean Atlantic Rentals saved the day by putting up a huge 40′ x 120′ tent right there in the Sea Ranch parking lot. Huge, right? Well it was barely big enough at times to hold the crowd, but no one seemed to mind, or to mind the weather. We had over 100 people show up at the door to buy their tickets while the rest had already purchased in advance online, along with some of the property owners for Joe Lamb Jr. rentals. So there they stood huddled under the tent to gladly pay their money to enjoy. Jonny Waters & Company band was amazing as they whipped folks up with their renditions of classics from Jimmy Buffet and Johnny Cash, Aerosmith, heck there was even some Nine Inch Nails thrown in there, and of course their popular originals like Flip Flop Cowboy. It was an awesome time, weather made no difference to any of us there. If you missed it, you missed a lot of food drink and fun! …take a look how close some of these were…..wow! Jolly Roger was just 3 points behind SaltyDawg on Judges Wings!! Congratulations to all the winners, but especially a huge congratulations to ALL that participated. There honestly was not a bad bite in the whole offering today. Outstanding efforts by the hardest working folks on the beach – our Restauranteurs. Jolly Roger, Aqua Restaurant, BK Shuckers, Café Pamlico (all the way from Buxton for this! ), New York Pizza Pub, Pigmans, SaltyDawg, Striper’s, and of course our hosts Beachside Bistro. (…boy did we work their bartenders today!) Ya’ll rock!!! Of course BIG thanks to our volunteers too….can’t do this without you. Our panel of five judges for doing the impossible; Mayor Sheila Davies, Daniel Zimmerman of Joe Lamb Jr., Chamber of Commerce President Karen Brown, Chamber Board member Mike Pringle and Town of KDH official Michael Midgett. And enormous thanks to Joe Lamb Jr. & Associates who have tirelessly supported this event two years now.